Seattle painter Laura Hamje's exhibit '53 Views on the Alaskan Way Viaduct' highlights shared experiences on the soon-to-be demolished structure. The series is on display at the Bryan Ohno Gallery. SEATTLE — As Seattle prepares for the Alaskan Way Viaduct to be torn down, a painter is showcasing shared experiences on the structure through a 53-piece exhibit that opened Thursday. 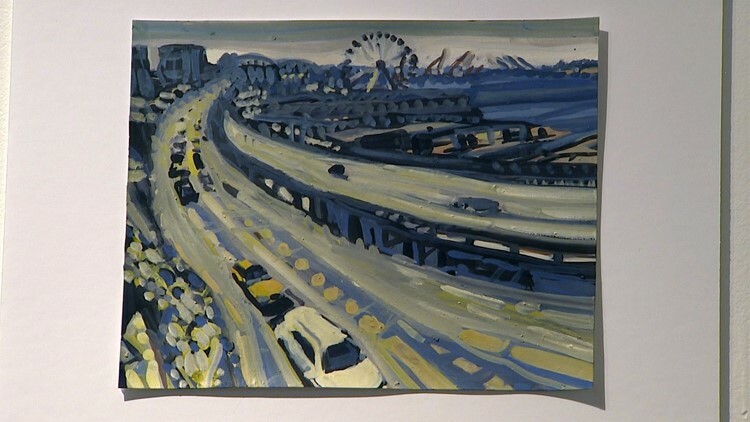 Painter Laura Hamje’s series “53 Views on the Alaskan Way Viaduct” captures stunning sunsets, gridlock, peering through rainy windows, the curve in the Battery Street Tunnel, catching a glimpse of the Great Wheel, and the darkness of Alaskan Way under the viaduct. “This is a very shared experience that connects us all in the city, and although not everybody finds it the most beautiful structure, how beautiful is it that we all share this?” said Hamje. The project started several years ago when Hamje began taking tons of photographs whenever she drove on the viaduct. As she poured over the pictures, Hamje would look for a moment that sparked an excitement in her and go with that. “It was a nice challenge trying to figure out what are all these important moments of the viaduct,” Hamje said. The series is on display at the Bryan Ohno Gallery in Seattle’s Chinatown-International District through January 5. In just over a month, the viaduct will close for good to make way for the new State Route 99 tunnel under downtown Seattle. Constructed in 1949, it was the first double-decker bridge in Washington and became a waterfront icon for decades to come. Demolition of the structure is expected to begin after the tunnel opens in February, and officials hope removal will be complete by summer. Seattle painter Laura Hamje's exhibit '53 Views on the Alaskan Way Viaduct' highlights shared experiences on the soon-to-be demolished structure. Hamje said Seattle, along with other major cities, is changing fast and leaving history behind. She said she hopes her paintings slow it down and help people remember the many moments they have had on the viaduct.